Expenses (planned, resources) InLoox PM creates automatically an Expenses (planned, resources) for the extisting planning with work packcages. The total work time of all work packcages is multiplied by the group purchasing price. All activity expenses are cumulated by group. 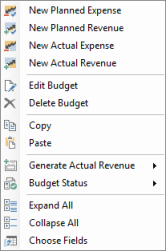 Create an actual revenue On the Edit tab, in the Budget group click New Actual Expense. An actual expense can be also generated, e.g. with the expense positions from the time tracking. Normally an actual expense is a bill. Filter the budgets Use the Filter feature, in the Common group, to quickly find the needed budget. Create a report In the Create group, click Create Report to create the budget data as a report. Load a report Select the report from the gallery view by clicking it, in the Report group. How to budget and track project costs | InLoox PM 8 • Copyright 1999-2019 © InLoox, Inc. All rights reserved.